Thanks to Audrey Kvedaras of DECA’s Visioning Committee for writing this fabulous update. DECA and the community look forward to seeing the final iteration of the Danforth Garage (or Danforth Barns as many say) Master Plan and the delineation of its phases, as it heads to Council this spring. 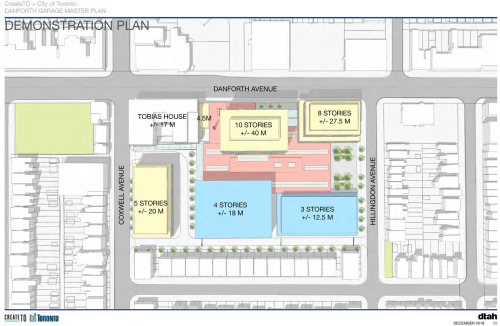 This Master Plan will confirm the locations of new buildings for the three initial tenants, the TTC, the TPS Divisions 54 & 55 and the Toronto Public Library Coxwell Branch and conceptually describe access through the site, locations of public spaces and sites for additional new buildings whose uses are yet to be determined (employment or residential). During the last public meeting, the possibility of interim uses for the Barns prior to their development was proposed. DECA welcomes animation of the site with a variety of uses including revenue-generating events drawn to the impressive space of the Barns, while the community waits for phase two of the development to be underway. To implement possible interim uses we anticipate a discussion of allocation of funds and of oversight to be part of this submission to Council. DECA looks forward to participating in the next phase of this project to create a material vision for the site, especially the heritage Barns. The opportunity exists to remedy the significant cultural and community space deficiencies that exist in our neighbourhood. 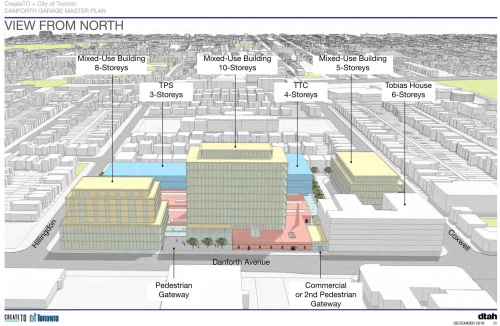 The Danforth Garage Master Planning Study provided community engagement through the guidance of a team of knowledgeable and professional City staff and private-sector consultants. We look forward to seeing, under the continued leadership of CreateTO, a vision for the site that manifests a unity, vitality and urban sensibility appropriate to this large site in the City of Toronto and is consistent with the images put forth as examples in the study.